There are many wonderful St Croix hotels to choose from, but finding the perfect hotel can make your island experience that much more special! So, how do you know which one to choose? Here are the top 5 rated hotels the island has to offer. You can't beat the location and fun activities of Hotel on the Cay! The rooms are somewhat plain, but who spends all that much time indoors when you're on a Caribbean island anyway? Hotel on the Cay is located right off the harbor of Christiansted. It has a beach bar and restaurant and amazing views of downtown. And there are really fun nighttime activities and events at Hotel on the Cay as well! The key selling point for this hotel is the location - right in the heart of Christiansted. You are in walking distance of tons of great shops, restaurants, bars, you name it! So you won't need to worry about driving or taxi rides. The hotel is located right on the water just by the Christiansted boardwalk. I haven't actually ever stayed in one of the rooms at Hotel Caravelle so I can't vouch for them personally. But the hotel gets good reviews, the staff is really nice, the food is great, and the location can't be beat! Club Comanche is right on the water in the heart of Christiansted. There are restaurants, shops, bars, and sea adventures just steps from the hotel's front door. If you like nightlife, then this hotel is great because some of the best bars in Christiansted are very close by. Club Comanche was recently fully refurbished and modernized but it somehow still manages to maintain a nice historic atmosphere. It reopened in December, 2009. King's Alley Hote is an upscale yet simple hotel. It is in a great location and the rooms are comfortable and renovated. There is no shortage of restaurants, shops, and bars within walking distance. There is wireless internet access in the lobby (but not in the rooms). Tamarind Reef Hotel is one of the top USVI hotels (U.S. Virgin Islands). It has a wide sandy beach with free chairs and umbrellas for guests. The rooms are clean and comfortable with modern amenities and many have small patios that look out over the water. There is a large pool that overlooks the sea and there are many amenities including snorkeling equipment and kayaking. Tamarind Reef Hotel also has two great restaurants/bars. The Galleon - considered one of the top "fine dining" St Croix restaurants. It overlooks the harbor at Green Cay Marina. The Deep End Bar & Restaurant - next to the pool and beach. It has excellent breakfast, lunch, dinner and cocktails and has a more informal atmosphere. All of these St Croix Hotels are great options depending on what you're looking for. But you don't necessarily need to be a guest of the hotel in order to enjoy the amenities. 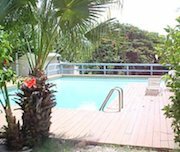 My family and I go to Hotel on the Cay all the time for fun St Croix activities, and we love the Club Comanche Restaurant and the Deep End Bar!